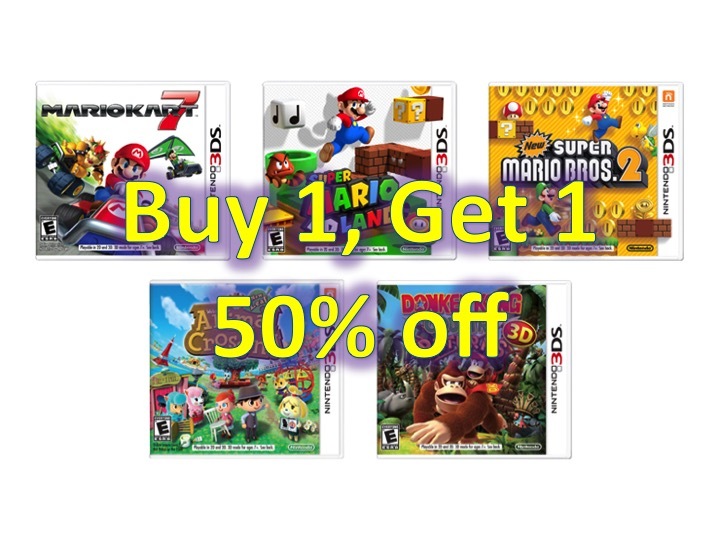 Buy 1, Get 1 50% off Nintendo 3DS Games! You are at:Home»DEALS»Buy 1, Get 1 50% off Nintendo 3DS Games! For a limited time, Best Buy is offering Buy 1, Get 1 50% off select Nintendo 3DS games! There are a wide variety of games available for sale including: Super Smash Bros., The Legend of Zelda: Majora’s Mask 3D, Pokémon Omega Ruby, Pokémon Alpha Sapphire, Xenoblade Chronicles 3D, Super Mario 3D Land, Mario Kart 7, New Super Mario Bros. 2, Animal Crossing: New Leaf and more! If you are not buying more than 1 game, buying them on Amazon will be cheaper. Animal Crossing: New Leaf is on sale for $24.99. Super Smash Bros. is on sale for $34.33. [DEAL OVER] Click here to head to Best Buy and start shopping or stop by your local Best Buy store. Follow @AsianGeekSquad for more deal updates!